Welcome to the Wareham Land Trust. We are the premier conservation organization in the Town of Wareham. 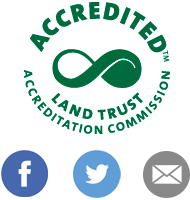 We promote land protection, natural resource education, and smart growth. Through a variety of well-established methods we safeguard valuable land and water resources. Our mission is to permanently protect special open spaces to benefit water quality, wildlife habitat, the citizens of Wareham, and for the economic enhancement of the Town. We hope that you will join us in protecting these priceless resources for future generations. The passion we feel for our mission is reflected in the educational forums we sponsor about local wildlife and the environment. Check our calendar of events for upcoming presentations. Take a few moments to visit our site. You can find details about our properties, how we protect open space and achieve our mission, and information about our upcoming events. Feel free to send us a note with your comments or questions. You can also engage us on Facebook and Twitter. Please consider becoming a member and supporting our cause. You can also help us through volunteer work on one of our committees or by becoming a land protection steward. We look forward to meeting you.